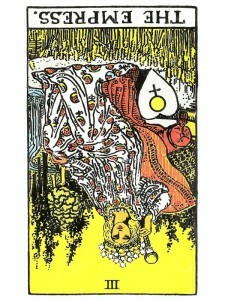 The Empress (R) tells you to emotionally preserve the essence and quality of life – mentally give birth to new ideas. Physically nurture your life creations and spiritually protect them with a healing and compassionate hand. Release yourself – hold on to your beliefs and “FEEL” the power inside you – allow the opposites to come together in conscious love and awareness. Recognize that feeling insecure or experiencing career setbacks are wasted energies that result in feelings of despair and failure – unproductive activity that will effect your home and your income. When this occurs, you need to seek “inner” council – seek answers to your questions and the solutions will present themselves. Knock and you will be allowed to enter. You can not retreat from your feelings – reject or deny your emotions or suppress your desires. You must solve your emotional problems through your intellectual awareness by calmly thinking through them and allowing yourself to experience a more stable and rewarding balance. How are your nurturing and mothering qualities being used right now? What creative projects are growing and developing? What are you attracting to you? Who is inspiring and nurturing you? How are you indulging your senses? In the first position: You will be passing on much of what past lives have taught you. In the second position: Your physical foundation is your best resource, but needs some work to restore it to good order. In the third position: Much of this call may be for the benefit of others rather than yourself. In the fourth position: Keep this ideal as a guide, not a firm blue print demanding exact construction to measurement. In the fifth position: You do not think that you are very prepared at the moment and this will affect your decisions. In the sixth position: At this time you may not be prepared emotionally for a big push in the mental plane. In the seventh position: In one extreme, you may have more doubts and hesitation about moving up the ladder than yon would like to admit. In another extreme you may actually want to step back for awhile. In the eighth position: You are not as prepared as you can and should be. In the ninth position: At one extreme, you may be disappointed in how well you have done the business of The Empress. Or, you may be less than pleased with your position of authority. In the tenth position: Others look to you for opportunities, knowledge and other things from the Empress’s grab bag. Yes, you. Hello! What does ‘You will be passing on much of what past fives have taught you.’ mean? Was it meant to say past lives? Thank you for this lovely website and all the beautiful insight you have shared on here! Kris, the Death card normally represents something that has been holding you back from moving forward in your physical and spiritual growth is going to be removed. When combined with the Empress (R) indicates that you should trust that your higher self will guide you as you seek solutions to your problems in a calm, balanced way. How would this card be interpreted in the first position with Death in the second position? Other cards in the spread are positive and portend very good fortune however, from what I understand this combination can be ominous. For me, this is a huge honor – Spirit has chosen you to go through something that will be another persons learning experience. Let me give you an example: You develop a medical condition that no one has ever seen or experienced before – those who treat you will be “learning” huge amounts of information in the process of curing you, which will help them in traveling their own paths and help many others down the road. What does it mean “Much of this call may be for the benefit of others rather than yourself”?